Family Planning NSW and the MHMS aim to screen 2,000 women for cervical cancer during the two-year pilot project. Many women participating in the project have never been screened, leaving them vulnerable to developing cervical cancer. This unique project utilises two methods of cervical screening; visual inspection with acetic acid (VIA) for women 25-49 years of age and cervical screening tests for women over 50 years of age. The World Health Organization (WHO) recommends the use of VIA in low resource settings, such as the Solomon Islands as it does not require a laboratory for processing specimens. In addition, the results of screening are available immediately, and women with suitable pre-cancerous lesions can be treated on site using cryotherapy. Using a single visit approach) is a distinct advantage where recalling clients for treatment can be challenging. VIA is new to the Solomon Islands. The aim of the project is to determine the feasibility of a single visit approach in the Solomon Islands. If the evaluation finds the project to be successful, a national program will be implemented with the aim of decreasing cervical cancer deaths in women of the Solomon Islands. Family Planning NSW is seeking funds to purchase equipment which will enable the expansion of the project. Funds would be used to purchase essential equipment such as cryotherapy guns, cryotherapy tips, sterilisers and carbon dioxide gas (the refrigerant used to treat pre-cancerous lesions). In April 2016, twelve doctors, midwives and nurses completed the first Solomon Islands training on cervical screening using a single visit approach. During the five day course, participants learned how to conduct cervical screening (VIA and Pap tests), cryotherapy of the cervix, counselling on cervical cancer prevention and community education. Course content was developed for the local context and delivered by nurse educators from Family Planning NSW with funding from the Australian Government. Since the training in April 2016, more than 200 women have been screened at three pilot sites in Honiara and Guadalcanal province. Women with positive results were either treated in local clinics using cryotherapy or referred to the National Referral Hospital for follow up, where the lead obstetrician and gynaecologist is supportive of this project. Early quality assurance visits to clinics have confirmed that clinicians in local clinics are providing high quality services to large numbers of women. A number of clinicians have demonstrated proficiency in detecting cervical abnormalities and have made referrals to the National Referral Hospital as necessary. Currently in the Solomon Islands cervical cancer is the second most common cause of cancer related deaths. Most cases of cervical cancer can be prevented through cervical screening and treatment of pre-cancerous lesions. As screening has failed to have an impact on the high rates of cervical cancer experienced by women in Solomon Islands they are of limited value in the Solomon Islands because they have to be sent offshore for processing at significant expense to the MHMS. In light of this, alternative methods of cervical screening and treatment need to be explored. By trialing the use of VIA and cryotherapy, the pilot project aims to reduce the morbidity and mortality from cervical cancer in Solomon Islands, which will benefit both women and their families. Visual inspection of the cervix with acetic acid is a safe and inexpensive procedure that is used to screen women for pre-cancerous changes of the cervix. The procedure involves insertion of a speculum to visualise the cervix then swabbing the cervix with 3-5% acetic acid. Acetic acid coagulates the protein in the nucleus of abnormal cells present in lesions of the cervix, giving them a white appearance. This reaction is called 'acetowhite' change. One minute after application of acetic acid the cervix is examined for the presence of acetowhite changes which may indicate pre-cancerous disease of the cervix. Acetowhite changes can be seen with the naked eye and a good light source. VIA is not an experimental procedure and is used in many countries worldwide. The WHO recommends VIA (and cryotherapy) as a useful tool for cervical cancer prevention in resource poor settings (WHO 2014). The current pilot project will determine if VIA in conjunction with cryotherapy treatment is suitable for the Solomon Islands context. The advantages of VIA are that it does not require the infrastructure that is essential for cervical screening tests, the equipment used is minimal and the result of the test is available immediately. The result of the VIA test is positive or negative. A negative result is given when the woman has a normal looking cervix before VIA and no acetowhite changes with VIA. These women will be told to attend for their next screen in 3 years. A positive result, indicated by dense and raised acetowhite changes with sharply outlined edges, can be discussed with the woman immediately. If the cervical lesion meets the criteria for cryotherapy and the woman consents to this procedure, treatment with cryotherapy can be offered at the same visit. Women with a VIA positive cervical lesion that does not meet the criteria for cryotherapy are referred to the National Referral Hospital (NRH) in Honiara for diagnosis and treatment. Women who have features suspicious of malignancy on their cervix at initial examination are also referred and VIA is not performed. VIA is not performed on women who are pregnant. Cryotherapy involves freezing the cervix, using either compressed carbon dioxide as the coolant. Treatment consists of applying the coolant via a probe continuously for 3 minutes, allowing the lesion to thaw for 5 minutes, and then applying the coolant for another 3-5 minute freeze. An ice ball is formed on the cervix as a result of the freezing and abnormal cervical tissue is destroyed. This procedure, called the "double freeze" technique, is easily performed without anaesthesia. Not all precancerous lesions of the cervix are suitable for cryotherapy. Lesions that cover greater than 75% of the cervix, extend out to the vaginal wall or into the cervical canal or extend beyond the margins of the cryotherapy tip cannot be treated with cryotherapy. The main advantages of cryotherapy are that the equipment needed is simple, the procedure is easy to learn and the procedure does not require local anaesthesia or electricity. The most common side effects of cryotherapy of the cervix include cramping, watery vaginal discharge and light bleeding all which can be managed by nurses. Major side effects of cryotherapy are very rare but may include heavy bleeding and infection. In the Fiji cervical screening project > 120 women were screened over a two year period; less than 1% of women experienced minor side effects and no women experienced major side effects. Disadvantages of cryotherapy are that, as it is a destructive treatment, no tissue is obtained for histological confirmation of the lesion. Also, a regular supply of liquid coolant is needed. In the Solomon Islands medical grade carbon dioxide gas is supplied by BOC. Family Planning NSW is working to assist people living in poverty and disadvantaged communities in the Pacific region to improve access to comprehensive reproductive and sexual health services with funding from DFAT and private donors. Family Planning NSW international projects promote the reproductive and sexual health and rights of marginalised people by ensuring men and women have access to the widest range of family planning methods and services. Our work is evidence-based and we understand the importance of capacity building and equipping local people with skills and knowledge to meet the needs of rural and remote communities and vulnerable populations. Family Planning NSW complies with the Australian Council for International Development Code of Conduct. Our voluntary adherence to the Code of Conduct demonstrates our commitment to ethical practice and public accountability. Within Australia, our education and training activities meet industry standards established by a range of bodies including the Australian Skills Quality Authority, the Royal Australasian College of General Practitioners, the College of Nursing and the NSW Institute of Teachers. Family Planning NSW operates internationally as Family Planning Australia. 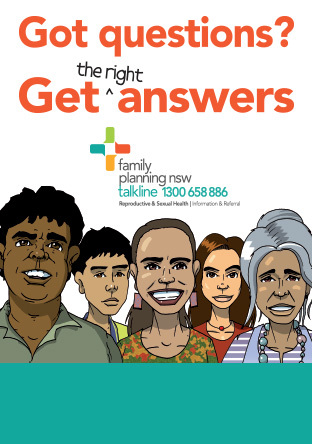 Family Planning NSW is NSW's leading provider of reproductive and sexual health services. We are experts on contraception, pregnancy options, sexually transmissible infections (STIs), sexuality and sexual function, menstruation, menopause, common gynaecological and vaginal problems, cervical screening, breast awareness and men's sexual health. We deliver services to 28,000 NSW based clients annually.